Letter from Mrs. Margaret B. Olmsted to the Berry Schools requesting information about the schools for a program on schools endorsed by the Daughters of the American Revolution. 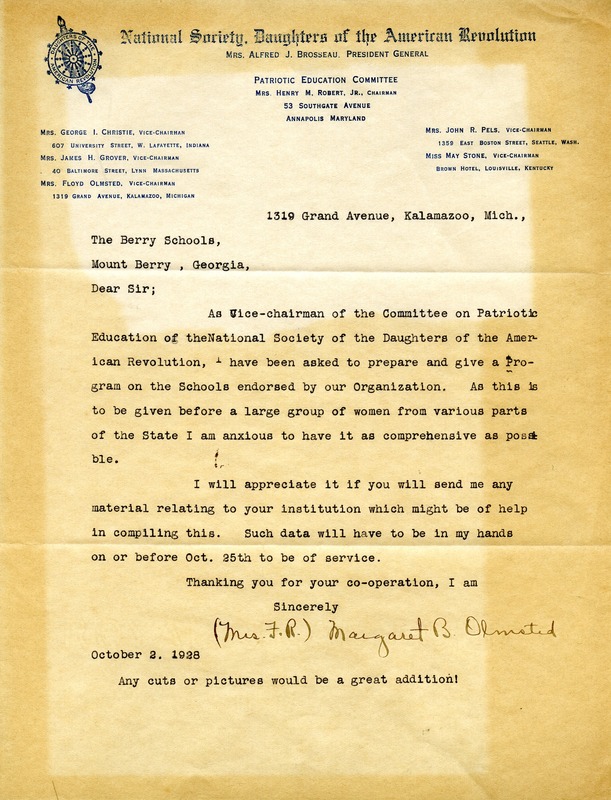 Mrs. Margaret B. Olmsted, “Letter from Mrs. Margaret B. Olmsted to The Berry Schools.” Martha Berry Digital Archive. Eds. Schlitz, Stephanie A., Rachel Renaud, Sarah Milway, et al. Mount Berry: Berry College, 2012. accessed April 20, 2019, https://mbda.berry.edu/items/show/7177.